Flying Femmes: The Female Pilots of World War II ~ The History Girl! The CAA (Civil Aeronautics Authority) says that women are psychologically not fitted to be pilots, but I see pictures every now and then of women who are teaching men to fly. We know that in England, where the need is great, women are ferrying planes and freeing innumerable men for combat service…I believe in this case, if the war goes on long enough, and women are patient, opportunity will come knocking at their doors. However, there is just a chance that this is not a time when women should be patient. We are in a war and we need to fight it with all our ability and every weapon possible. Women pilots, in this particular case, are a weapon waiting to be used. Finally, in early September 1942, the WAFS (Women’s Auxiliary Ferry Squadron) was formed. Headed by Nancy Harkness Love, the group started out with a mere twenty-eight members. 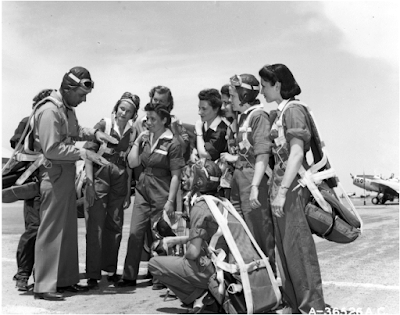 Days later, the WFTD (Women’s Flying Training Detachment) was formed with Jackie Cochran as leader. 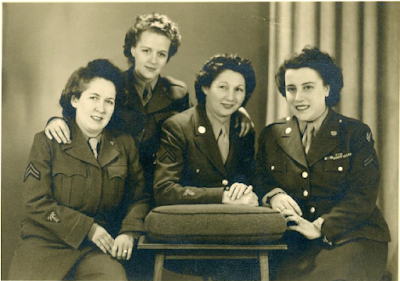 When the WAFS and the WFTD combined in August 1943, the WASPs (Women’s Air Force Service Pilots) were born. Unlike the other branches of the military, the women of the WASP were never given military status during World War II. They were considered civilians who worked with the air force. Regardless, these women aided the war effort bravely, defying social stereotypes. With the start of the war, I became convinced that there was a sound, beneficial place for women in the air—not to compete with or displace the men pilots, but to supplement them—and I never let up trying to establish in practice the birth of my belief…What will be the ultimate result—good or bad—will be up to the girls themselves. You of the first classes will have the real responsibility. By your actions and results the future course will be set. You have my reputation in your hands. Also, you have my faith. I have no fear—I know you can do the job. Members of the WAACs Air Corps train in Newark, New Jersey. National Guard Militia Museum of New Jersey. She wanted the women to be able to do everything stateside that the men did and then they could go off to war because the jobs were being done here by women…We did all the jobs, not just ferrying aircrafts, like towing targets for the anti-aircraft practice shooting or flying at night so that beacons would have an opportunity to practice or flying gunners so they would have practice shooting from a moving aircraft. When we went down to Sweetwater Avenger Field, Sweetwater, Texas where we were trained, we started out in a Stearman, which is an open biplane, which was 220 horsepower, so that was quite a jump. And in the beginning of ’44 they wanted to experiment to see if, because it’s usually primary, basic, advanced, and they wanted to see if they could eliminate the basic training and have you go directly from primary into advanced. They said well let’s try it out on the women and if women can do it then we’ll change the training. So we went from 220 horsepower aircraft directly into a 650 horsepower aircraft. It was quite a jump, but we did it. When asked about the most nerve-racking part of training, Bee answered, “You were always afraid of the testing. You had two deck rides in every phase and there were three different phases. If you didn’t pass then you could be washed out, so we were always very apprehensive about any flight testing.” The instrument training presented a particular hardship for Bee. In a letter to her mother on June 6, 1944, she said, “I am practically on the verge of a nervous breakdown. Instruments have turned from a course of interest to one of torture.” Many of her letters home expressed a fear that she would wash out and be sent home. Of course, this worry never materialized, and Bee completed her training. Her first assignment was at the Pecos Air Force Base in Pecos, Texas. WASP trainees and their instructor. US Air Force. There was resentment against women by some but certainly not by all. There were some that were at a base where the women were sent and they refused to let them fly anything except the smallest aircraft. But when things like that happened, they would complain to Jacqueline Cochran, who was in Washington, D.C., and when she went out to meet anybody it was like General Arnold was there. She would be speaking for him and she would go out and she would straighten out the commanding officer and tell him that they were to be able to fly anything and everything. Luckily, Bee did not personally experience any such resentment. She was lucky enough to encounter military men who treated her with respect. When asked how her life changed after being in the WASP, she fondly recalled, “Well, it completely turned it around. I had never dreamt about a career in flying.” She continued her flying career after the war. She started a ferrying business, sold airplanes and joined a group of veterans who established a flight school. The WASP program was considered a success. General Henry H. Arnold, the commanding general of the army air force, praised the women of the WASP. He proudly stated, “Certainly we haven’t been able to build an airplane you can’t handle…We will know that they can handle our fastest fighters, our heaviest bombers; we will know that they are capable of ferrying, target towing, flying training, test flying and the countless other activities which you have proved you can do.” Despite an impressive service record, the WASPs were never integrated into the U.S. Army Air Force. The group was disbanded on December 20, 1944. Thirty-eight WASPs died during World War II. WASPs were not given military status until 1977. The often overlooked female volunteers of the British Air Transport Auxiliary (ATA) flew planes back and forth during World War II. As the initiative of Gerard d’Erlanger, director of British Airways, the ATA was envisioned as a way for pilots who would not be readily accepted into the military to help the war effort. By September 11, 1939, mere days into World War II, the first twenty-six pilots of the ATA stood at the ready. It was not long before the need for more pilots surfaced. With Britain in a tense standoff with Nazi Germany, more pilots where necessary to fly combat missions, which in turn meant that more pilots were required to ferry planes. Desperation for more recruits led to campaigns for pilots around the world, and many American citizens became members of the ATA. Both men and women served in this capacity and ferried planes to be repaired or delivered from manufacturing points to squadrons. Within the first month of the war, women were considered as possible pilots. By New Year’s Day 1940, the first handful of women had signed on with the ATA. Much like other duties, performed by women during wartime, these pilots helped to free up more men for active combat. These civilian pilots had dangerous jobs. There were instances when they were shot at during ferrying missions. Bad weather was a constant concern. Pilots often flew several different, sometimes completely unfamiliar, planes in any given day. The threat of enemy attack or contact was made that much more disastrous when coupled with the fact that these pilots were unarmed during their flights. Although the casualty rate for the ATA was low, many brave men and women still lost their lives flying for this auxiliary. The pilots who served in the ATA came from twenty-five different countries. One pilot in particular, Suzanne Humphreys-Ford-de Florez, was a New Jersey native. Born in 1915 in Far Hills, New Jersey, Suzanne was intrigued by aviation at an early age. Suzanne began taking flight lessons when she was sixteen. By the time she entered college at New York University, she was quite the talented pilot. Suzanne performed in air shows, often making the local papers. Once the war was on, Suzanne, like many others, had a deep desire to do her part. As luck would have it, she got her chance with the ATA. During her time as a ferry pilot, she flew around seventy-five different planes. She was stationed in Scotland and Northern Ireland. Her duties with the ATA came to an end on October 31, 1945, and she soon returned to the states. All told, 157 men and 16 women died flying for the ATA during the course of the conflict. The ATA was deactivated in November 1945. Its pilots’ records were truly amazing, with around 309,000 aircraft deliveries completed. These brave men and women proved that civilian pilots were an invaluable addition to combat forces. The women, in particular, proved that they could learn to fly virtually any type of plane, even under the most stressful conditions. Patricia Chappine is an adjunct professor at the Richard Stockton College of New Jersey and Atlantic Cape Community College. She earned a Bachelor’s degree in sociology and a Master’s degree in Holocaust and genocide studies from the Richard Stockton College of New Jersey and is currently a PhD student in the history and culture program at Drew University. She is a member of the New Jersey Historical Society, Atlantic County Historical Society, and Hammonton Historical Society. 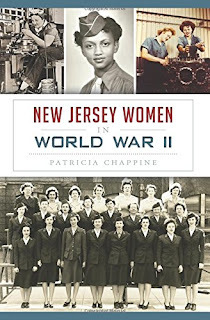 Purchase a copy of her book, New Jersey Women in World War II, on Amazon or at your local retailer.